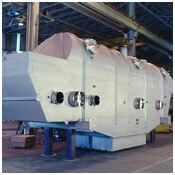 Carrier vibrating fluid bed dryers are designed to dry and/or cool a variety of products at a wide range of feed rates. Like conventional fluid bed dryers, vibrating fluid bed dryers function by passing a process gas directly through a bed of solids via a perforated plate or another type of fluidizing media. Vibration is added to aid in fluidization of more difficult materials. Material that has a wide particle size distribution — fluid bed dryer vibration will help to discharge oversize particles that will not fluidize. Temperature sensitive materials — a sub-fluidized condition can be created to produce plug flow and eliminate burning or discoloration of individual particles. Fragile materials — low amplitude fluid bed dryer vibration and reduced fluidizing velocity create a gentle bed, which causes less degradation than conventional fluid bed dryers or other mechanical dryers. Lower fluidizing velocities are required, making the fluid bed dryer system more energy efficient. Re-circulated gas and closed-loop systems available for improved efficiency or solvent recovery. Clean-in-place and fire suppression systems available as part of the vibrating fluid bed dryer, where necessary. Carrier’s patented Delta-Phase® Drive option permits on-line adjustment of angle of vibration and precise retention time control. Sanitary, U.S.D.A. (3A) approved vibrating fluid bed dryer construction. For more information on Vibrating Fluid Bed Dryers, refer to brochure #16510.